The third car in GMP's die-cast series of Le Mans winning Ford GT's. 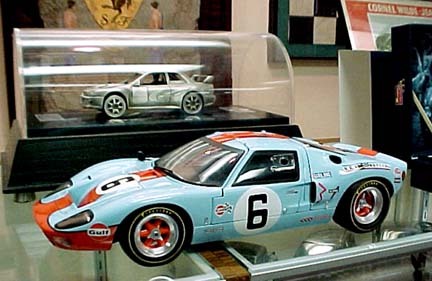 A 1/12 scale replica of the Ford Gulf GT40 chassis number 1075 driven to victory in 1969 by Jacky Ickx and Jackie Oliver. 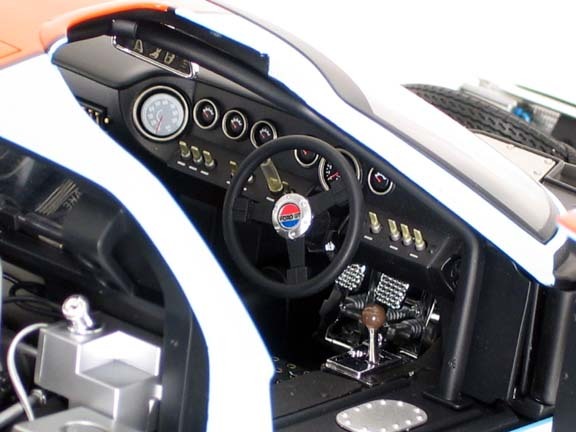 This amazing die-cast model of the Ford Gulf GT40 Le Mans car is painstakingly hand crafted by GMP to give a unsurpassable detailed 1/12 replica. It is one of the most accurate representations you can find, and as a limited edition of one of only 2,000 ever made is highly sort after. It's exclusive design constructed from more than 400 individual parts meticulously detailed, including many that are photo etched. 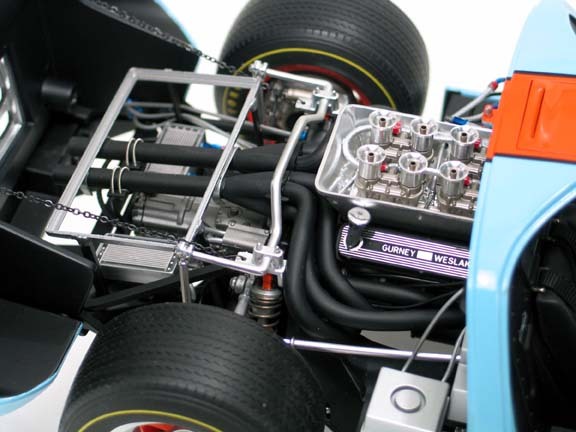 The piece also features removable body panels, genuine rubber tires, hoses and belts, functioning suspension, 'pose-able' steering, a highly detailed engine, transmission and interior. 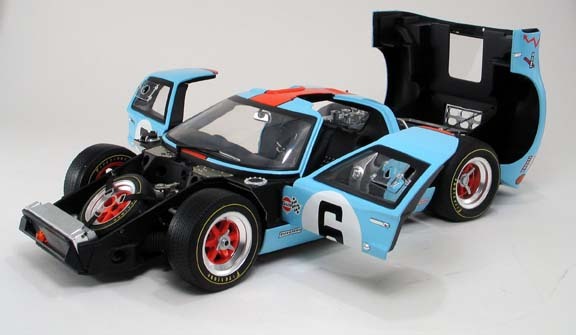 This history making GT40 Mark I is recreated in all its glory as it raced in 1969. 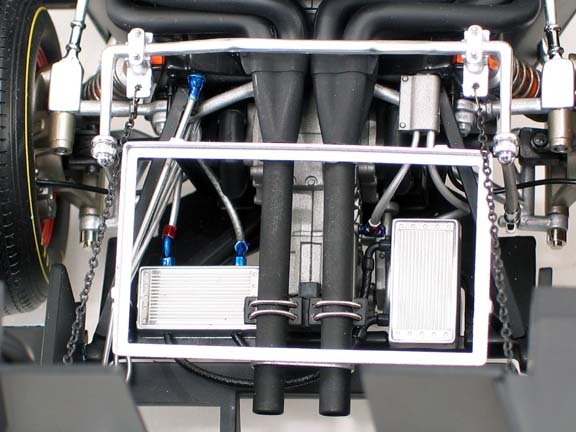 Width 6", Height 3 1/2", Length 14 1/4"
In 1969 the GT40 had pulled off the seemingly impossible; a fourth consecutive win for Ford in the most exciting finish Le Mans had ever witnessed. 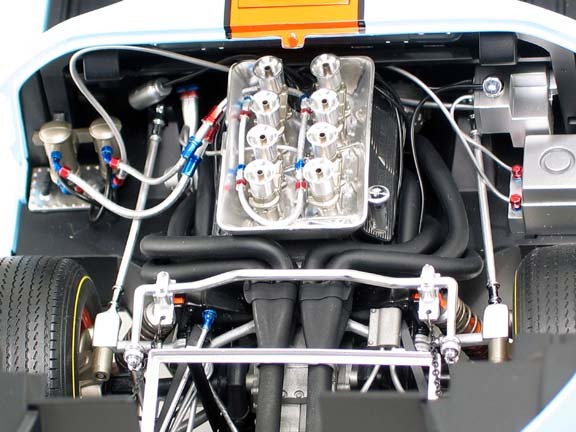 This remarkable finish was achieved with the GT40 P/1075 - the same car that had won the previous year. It was the fourth consecutive overall victory for the Ford Motor Company and the second consecutive win for 1075 - the first time the 24 Hours had been won by the same car twice. To add to the glory, 1075 won the Index of Thermal Efficiency beating out the other two GT40 entries. The 1969 season marked the end of the line for the Ford GT, which debuted in 1964, as rule changes by the European governing body made the car illegal for competition in 1970. This effectively signalled the end of the Ford GT40 as a race car in international events. Even though The GT40 had claimed its own place in the history of Le Mans and motor racing. 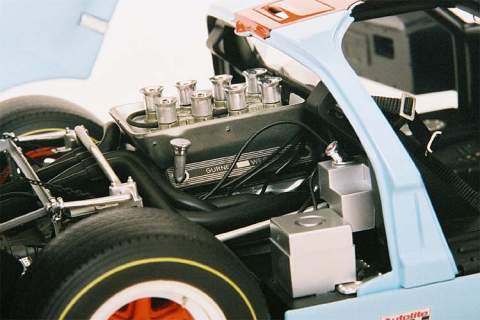 The 1075 GT40 was powered by a 302 cubic inch Ford V-8 engine with Gurney/Weslake heads.